Prediction: Clevenger will beat Malachy in the 1600. Live Stream?? or just Twitter updates? I didn’t get any twitter updates. 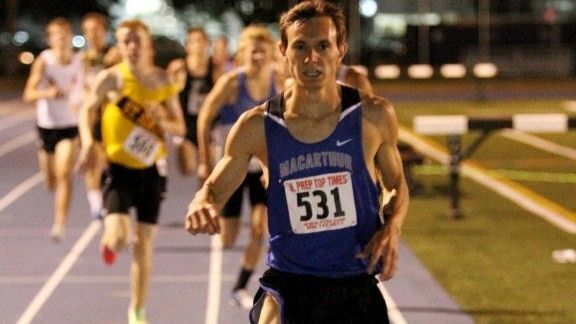 I saw Mark Derrick ran 4:13 (4:11 for 1600), but that’s it. Clevenger went with about 300 to go and dropped every body. 4:08. Brewster in the 2 mile almost pulled the Craven v Finley. Sandovold put up arms to celebrate with about 5 meters to go and Brewster made a last push and just missed it. But still a huge race for him 9:04 for the full 2 mile. Thanks for the meet last night - came down from Wisconsin to check it out and watch my son run. Would you have the 1600 meter times for the freshmen boys race? These arent listed in your final results. Thanks for the results - I already had the mile time results - I am looking for any 1600 results that may have been taken last night as they did in the other races. Anyone have those?